Ann Michels in rehearsal for Artistry’s upcoming production of Victor/Victoria. Photo by Devon Cox. 1982 was an important year in music. It was the year that the first commercial CD player went on sale, the year that Michael Jackson’s Thriller dropped, and a song called “Eye of the Tiger” rode the recently launched MTV network to the top of the charts, chased by Olivia Newton-John’s “Physical“. And, for the present purposes, it was the year that a film director named Blake Edwards began looking for a star vehicle to feature his wife. Twenty years before, Edwards was one of the hottest directors in Hollywood, helming hits like Breakfast at Tiffany’s and the highly successful Pink Panther franchise. His wife, Julie Andrews, was also a hot commodity in Hollywood during the 1960s, starring in a string of hit movie-musicals: Camelot (1960), Mary Poppins (1964), The Sound of Music (1965), and Thoroughly Modern Millie (1967). By the 1980s, however, both of their stars’ luster had faded somewhat. Edwards went looking for a story that rekindle both of their careers and showcase his wife’s ample vocal talent. His pick? A 1933 German film called Viktor/Viktoria, in which a woman poses as a female impersonator. 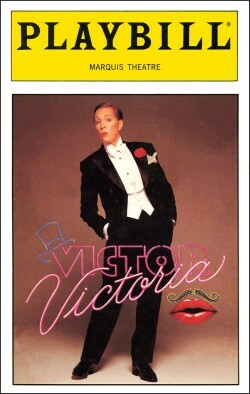 A poster for the 1982 film musical Victor/Victoria, which inspired the 1995 stage musical. 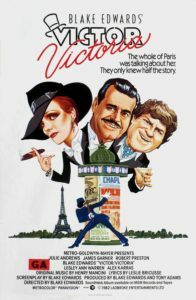 The resulting 1982 film, Victor/Victoria, was a musical with a script by Edwards, a score by Henry Mancini, and lyrics by Leslie Bricusse. Julie Andrews, naturally, played the title roles of struggling singer Victoria and her stage identity Victor. Not following? Victoria the woman poses as Victor the man, who is in turn posing as a woman; hilarity and romantic complications ensue. Decades before RuPaul’s drag race popularized a certain flavor of female impersonation, Victor/Victoria played off the opposite idea and walked off with a tidy profit, an Academy Award for Best Original Song Score, and a Golden Globe Award for Andrews. A decade later, Edwards and Andrews started looking at a potential second life for their 1982 project…this time as a Broadway musical. 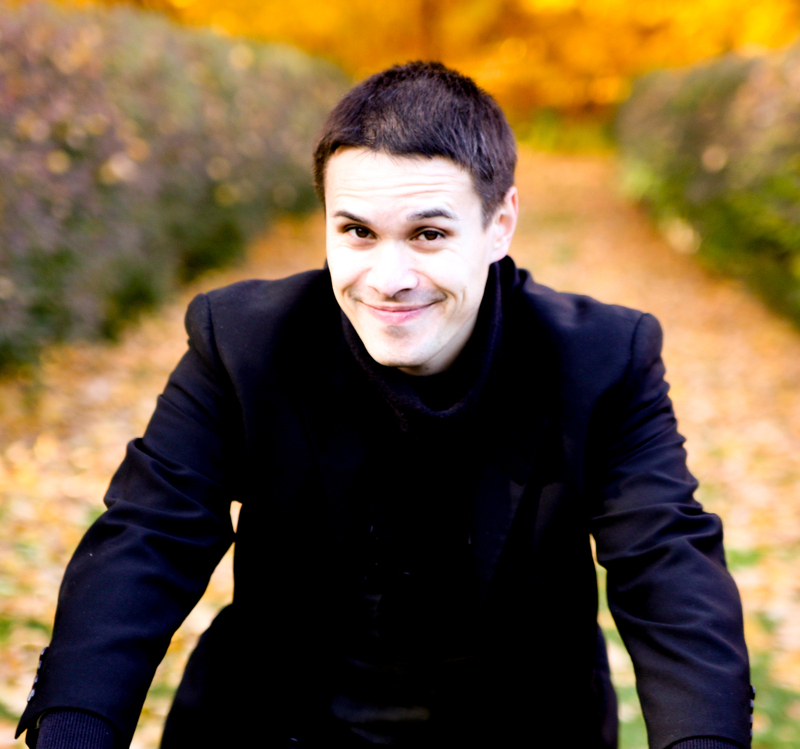 Mancini had passed away, so an up-and-coming young composer named Frank Wildhorn – just finished with a show called Jekyll & Hyde – was brought in to expand the score. The pre-Broadway tryout began at Minneapolis’ own Orpheum Theatre in June 1995, continued to the Shubert Theatre in Chicago, and opened in New York City at the Marquis Theatre in October of that same year. The rest, as they say, is history. 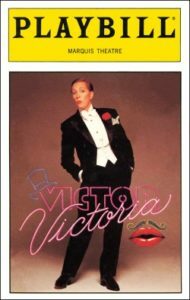 A playbill for the Broadway run of Victor/Victoria, which started its out-of-town run at the Orpheum Theatre in Minneapolis. Just a bit south – and now in 2019 – the ice is melting away and Artistry is prepping its own production of the stage musical Victor/Victoria. Opening April 6 at the Schneider Theater in the Bloomington Center for the Arts, the show stars singer-actor Ann Michels as Victoria and her alter/stage ego Victor. 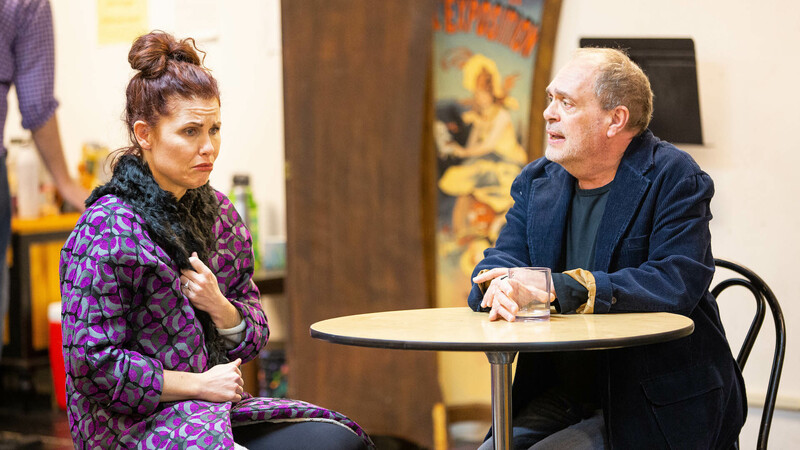 Basil Considine spoke with Ann Michels about her career, work/life balance, and stepping into the production’s twin leading roles. You grew up in Faribault – do you make it back there very often? My mother still lives in Faribault, so I get there to visit her when I can. 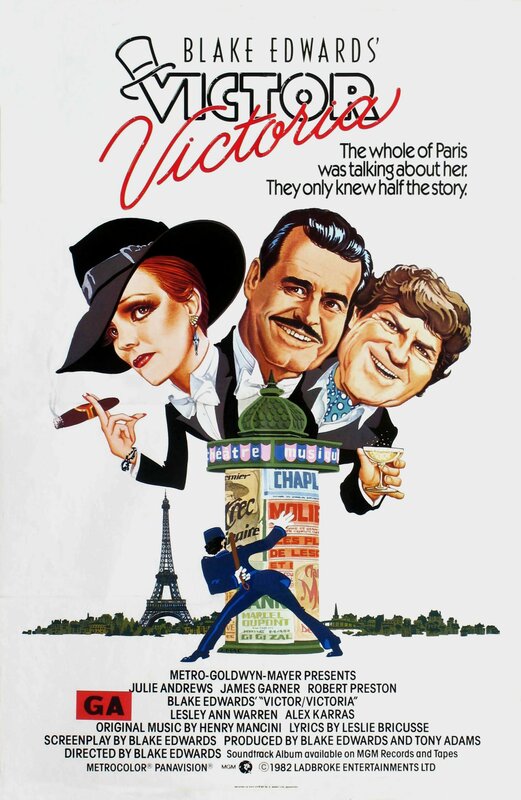 Victor/Victoria began its life as a film musical starring Julie Andrews. Do you recall how and when you first encountered the film and stage versions? When I was a kid I remember watching the movie with my mom when it was played on network television. Of course I already adored Julie Andrews, based solely on her performance as Maria Von Trapp in The Sound of Music, and I also loved James Garner from The Rockford Files, which we always watched when I was really little, even in reruns. It was so interesting for me to see those two iconic characters play entirely different people. As far as the stage musical was concerned, I never saw its pre-Broadway run here in Minneapolis in 1995, and I hadn’t seen any stage production of it at all until I was approached about doing the show. It was then that I found a copy of the Broadway version – and loved it. When did you start preparing for this particular role? What is your process like? One of my favorite parts of being an actor is having a legitimate excuse to learn something new. I always start by reading the script and getting a first impression, and to decide what I need to know. I also research the writers themselves to try to understand why they wanted to do in the piece. I therefore started reading about Blake Edwards and Julie Andrews (his wife) and any interviews or writing that they’d done about the material. I often investigate source material, which in this case was a 1933 German musical film, Viktor und Viktoria. Luckily, I was able to find bits of that film online; although I couldn’t understand what they were saying, the actors’ adroitness and command of the physical comedy was brilliant and really informative. Next, I got the music into my head as quickly as possible, listening the Broadway cast album. Since I was doing Holiday Inn at Chanhassen Dinner Theaters right up to the start of rehearsals, I had a lot of captive time in my car to listen to it going to and from work. Singer-actor Ann Michels stars as the titular character(s) in Artistry’s upcoming production of Victor/Victoria, opening April 6 in Bloomington, MN. In the time since Victor/Victoria premiered on stage in 1995, there has been a tremendous change in the ready availability of music recordings and scores, especially for Broadway shows. This has had a significant impact in how many (and especially younger) singer-actors learn roles. Has your process of learning a musical theatre role evolved significantly with the digital revolution? I won’t rely solely on recordings to learn a role. As was the case with this score, there were a lot of differences between what was on the page and what Julie Andrews sang in the show and on the soundtrack. She took a lot of liberties based on what her voice was doing at the time or wanting to color the material dramatically in some way. I wanted to learn what the composer composed and adjust as needed. I also have to embrace the voice I have and make the material my own. I’m no Julie Andrews, so there’s no sense trying to be her. (I hear too many people merely mimicking artists, and that’s not very interesting to me.) Recordings are informative in learning about the play, getting an idea about what the composers/librettists want, and getting an idea of notes and lyrics – but after I’ve grasped those things, I just let it go, address the music on the page, and translate the words and music through my body and soul. At this point in your career, do you have any specific priorities that you look for in a role or engagement? Well, I wish I could say I had that luxury. Most of the time I just need a job! I feel blessed when I get to tell a well written story that moves an audience to feel something – to escape the difficulties of their own lives and come out better on the other side of it. If we all learn something new about ourselves and can see the world through different eyes, all the better. My brain craves to learn something new, so I love to be challenged by all different styles of this medium, and to stretch myself beyond my perceived capabilities. Ann Michels (left) in rehearsal for Artistry’s Victor/Victoria. Photo by Devon Cox. What’s a favorite thing about playing this role? With Victoria Grant, I get to use a smorgasbord of skills. Vocally, I’m using both my classical and jazz chops. There’s both drama and great comedy. Above all that, however, I think this story has a beautiful message – to love who you love. What could be better? The working actor’s refrain is “I’m sorry, I have rehearsal.” During the odd moments (or polar vortexes) when you’re not doing a show or prepping a show, what are some activities (or lack thereof) that you enjoy? I love to be outside, walking with my dogs, or hiking through the woods. A trip to the Boundary Waters would be heaven. I love sharing a well-crafted meal with my cute husband at some local restaurant, puttering around in the yard, digging in the dirt, watching birds and butterflies, reading books, watching documentaries, addressing the ever-evolving art project known as our home, communing with dear friends and family, and finding inspiration in others’ work, whether it be visual art, poetry, theater, dance or music. It’s a good life. For the dog lovers: What kind/breeds of dogs do you have? How many? 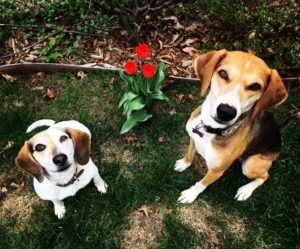 I have two dog: Millie, who is a Treeing Walker Coonhound/Catahoula Leopard Dog mix, and Lucy, who is a Beagle/Jack Russell mix. They are honestly one of the greatest joys in my life. Ann Michels’ dogs. Photo courtesy of the artist. Besides Julie Andrews, do you have any musical theatre icons or role models? 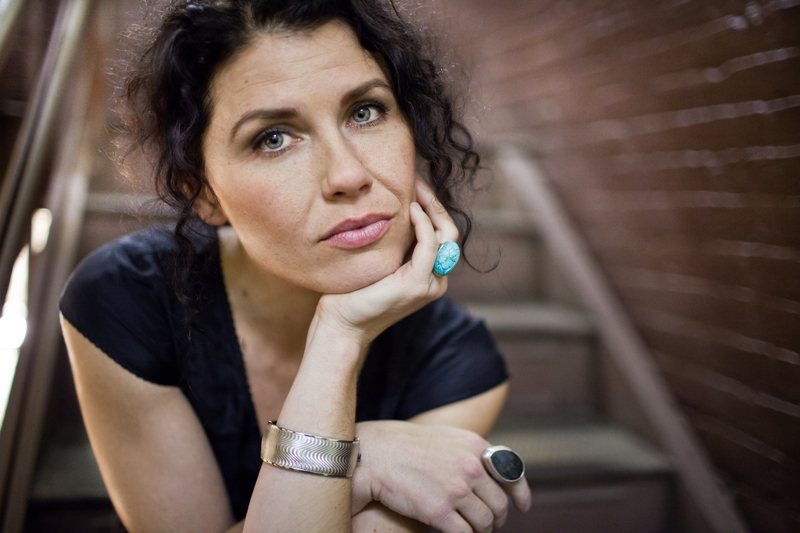 Faribault is a good hour or so’s drive from the Twin Cities – does your mother see you in shows often? My mother, Cinda, sees me in nearly every show I do. I can’t remember the last time she missed a theatrical production, to be honest. At what point in a run do you prefer to have family see you? I generally don’t need family there for opening, mostly because it’s such a crazy evening, and I wouldn’t have much time to spend with them afterwards. If they’re available, my best friend Stacia and my husband Matt are usually my opening night guests. I can then get an honest, supportive, and rather expert assessment of the show, which I rely on for my own sanity. What’s one of the oddest skills that you’ve had to learn for a part? I once had to fall off of a 6-foot platform, which took some practice. I’ve sort of become an expert at wiping out. Artistry’s production of Victor/Victoria opens April 6 at the Bloomington Center for the Performing Arts in Bloomington, MN.